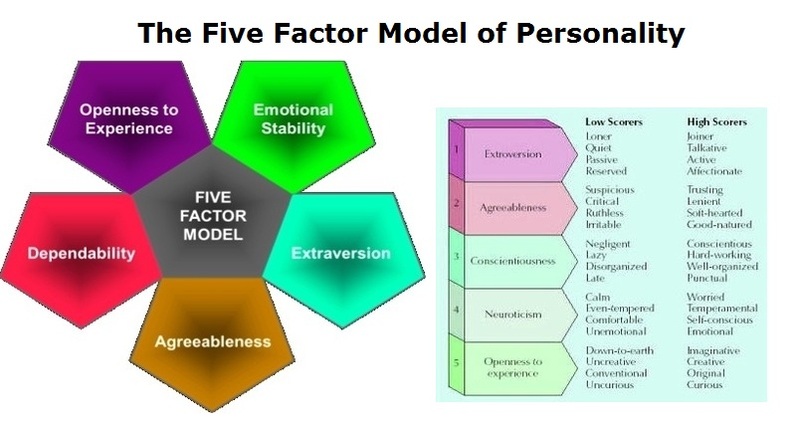 Five Factor Model Of Personality – Five Factor Model – Personality Model – Different Personalities Model – The 5 factor model of personality is a business psychology framework that helps analyze a stakeholder through openness to experience, emotional stability (neuroticism), extroversion, agreeableness and dependability (contentiousness). Each stakeholder and/or individual is scored against these 5 factors. The score is then analyzed and depending on the result, one would adjust their actions or behavior to address the personality and the needs of the stakeholder. The analysis can be also completed on one self. This entry was posted in HR and tagged 5 factor model, agreeableness, business personality model, dependability, emotional stability, extroversion, five factor model, five factor model of personality, five factor model of personality analysis, five factor model of personality chart, five factor model of personality diagram, five factor model of personality explained, five factor model of personality framework, five factor model of personality methodology, openness to experience, personality model, what is five factor model of personality by admin. Bookmark the permalink.